Favorite food: Right now cucumbers. Favorite toy: A tie between balls and socks. Favorite activity: I love to play with my favorite ball, especially when my parents will throw it for me. Special talents: I know how to give my mommy hugs. 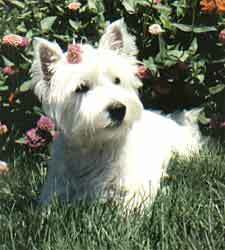 Most embarrassing moment: I can't think of any, as you know I am a Westie and I am perfect. Most trouble I ever got into: When I chewed up mommies shoes. My favorite friends: My family. Biggest adventure: Staying with my Grandmommie when my parents went to California for a whole week.